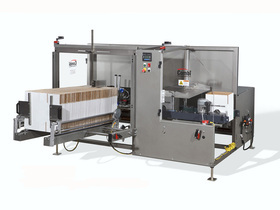 The Combi Packaging System side belt-drive case erector can form and bottom seal cases at speeds up to 20 cases per minute. Combi's new product offerings are a response to our customers' need for faster speeds. This case erecting machine is built with the same optimal durability, reliability and value the 2-EZ® family of case erectors has provided over the years. This box erector is engineered with the industry's strongest frame (lifetime warranty) for the most demanding 3-shift environments, the 2-EZ® HS case erector can readily integrate into your existing line. Combi's EZ-load walk-in case magazine and 3-minute "No Tool" changeover system are standard features. The 2-EZ® side belt drive units are designed for years of dependable service and can form and seal the widest variety of cases, from single wall to triple wall corrugated.